This is how it works. 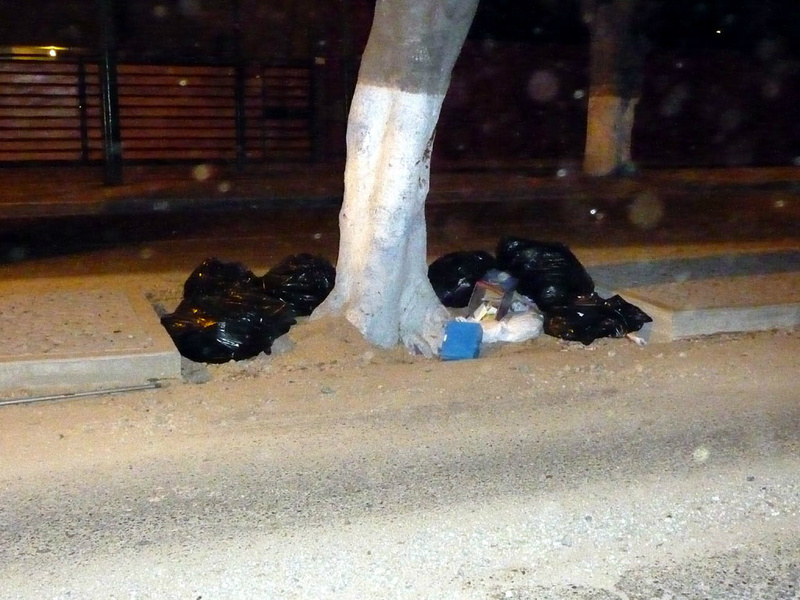 There is no municipal policy on garbage, but, there is the simple fact that some trash is worth something. If there's money in it there are people willing to collect it. And that's what happens: at night different private garbage hunters come looking for different things: plastics, clothing, batteries. They tear open the bags and take what is of their liking. To help minimize the mess and to help the garbage hunters G. puts all the organic material in 1 bag, the dry stuff in the other. So do a lot of people. To make this system more effective some collectors have a fixed day: Thursday the plastic person comes. Fridays the battery man. You just put your stuff in the street on the right day and it works a charm. Everything worth recycling is taken. Only that what is of no use to anybody gets taken by the municipal garbage collection service. Yesterday night we were invited to join a bike ride in Miraflores, Lima. The day before we met Hugo as a participant in our workshop (on how people can make their city theirs). Hugo is one of the organizers of the bikeride. 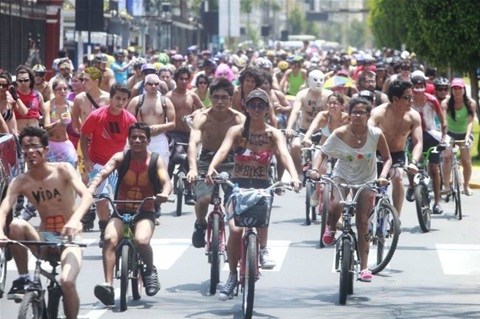 They have organized many bikerides the past years and they get more crowded every time. Last night was a big crowd, we estimate like 650 people. It works like this. 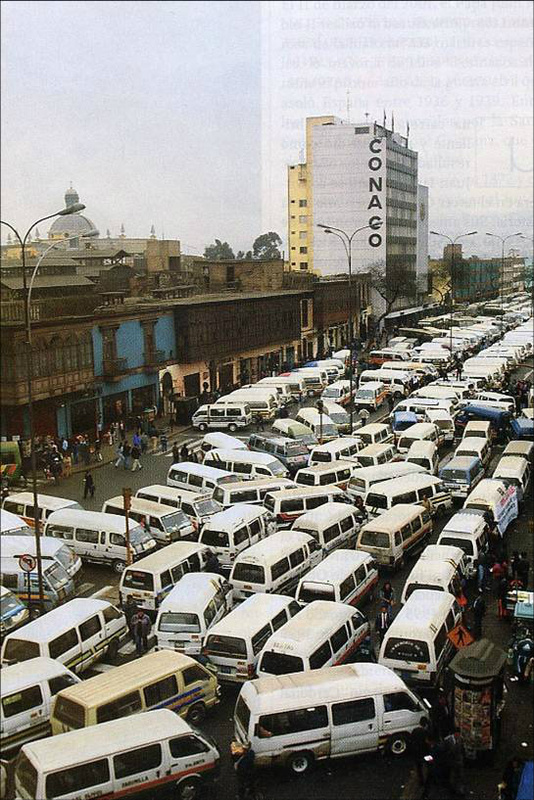 The city of Lima is not equipped for biking. More important is the attitude of the persons that are in the cars. The drivers in the cars really hate other users on the asphalt, with only two wheels. The cars make it impossible to ride in a relaxed manner. On the road reigns the law of the jungle. But,..... the strategy of actibicimo is... If you post it on facebook and then show up with like 700 bikes and are well organized with lights, sound and reflective vests, the traffic will be paralized. And that is exactly what has happenend. We cycled on the main roads that normally are ruled by big SUV's, busses trucks and so on. Because the group energy is great and it feels like a big mass, it really changes the dynamics. The bike is dominant, at least for this moment. Aside from the big main streets we were also going through residential erea' s where the guard-dogs beacame very nervious of the big group of cyclist' ringing bells. We were passing the villa' s of the rich, because Miraflores is a district for the 'Gentita' and it felt strongly like a religious procession, advocating a different lifestyle. To be careful with the environment and to share the city in a more fare way. Later that night, when we were biking home alone, it was the two of us against all the cars again. We were very lucky that no driver has recognized us from the parade. 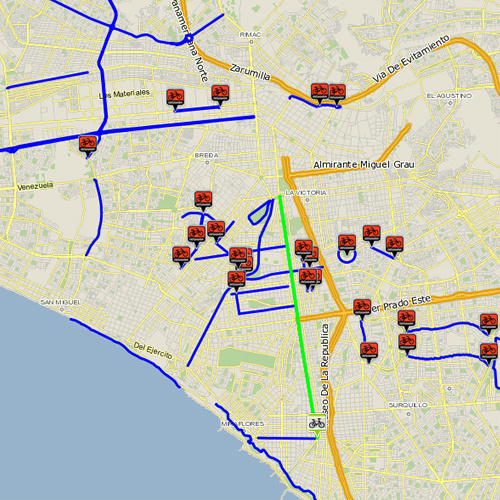 Map of bicycle-lanes in Lima 2013. Wednesday 6th of february at 9.00 am at Tupac. Reclaiming the city: how citizens can create the new city. After decades of city planning through economy: “money is the planner”, it is now time to make changes: the people are the planner. 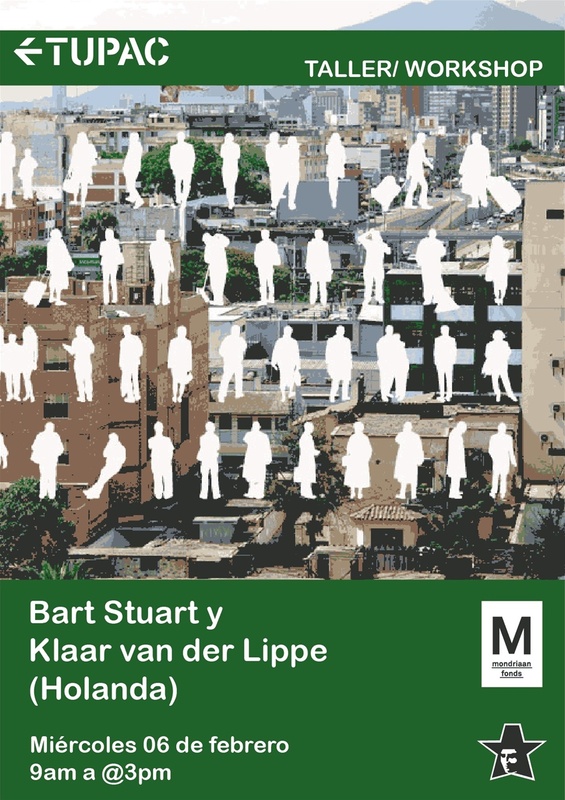 work together with citizens of Lima to make strategies for the new city. location: roof terrace at Tupac. excursion and urban pick nick. Are you born with morality or is a learned skill? Is there a basis in everyone or it is a cultural matter. Everything here is confusing. In the neighborhood meetings of the working group for the tenure of Susana Villarán there is a great social commitment. The group is self-organized, self-initiated and has no central leadership. 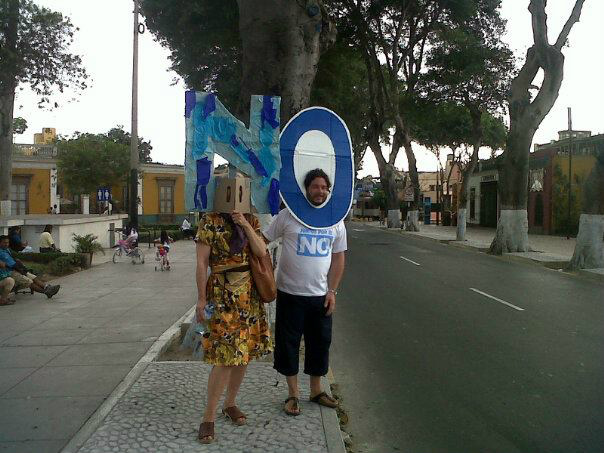 Throughout Lima there are groups like this . Tomorrow we go to help to make panels. Newspaper articles, posters, a self-drawn cartoon are taped on cardboard refrigerator boxes. This panel is then put in a park to provoke discussion. Perfect example of active citizenship. At the same time, lakes are sold to investors, everybody warns eachother for thieves and nobody expects decent governance. Do we only meet the good guys or does everyone has a double role? Is the culture of power just different? The people we meet are both cynical and naively hopeful when it comes to the future of Peru. How is that? 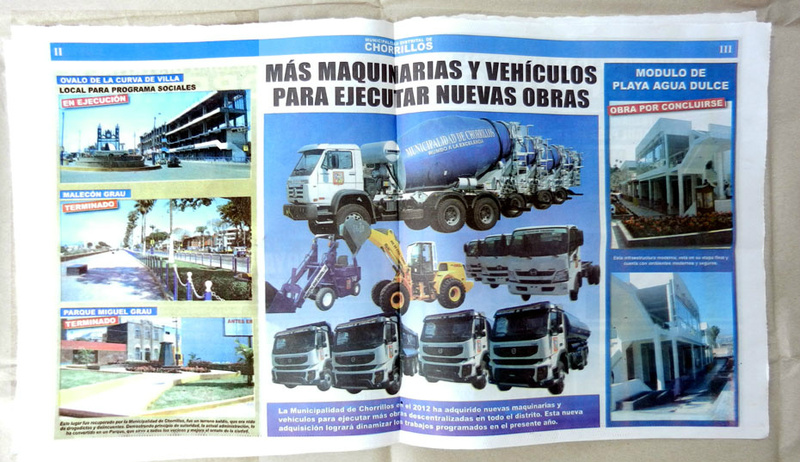 Obras: here your mayor works for you! It takes a while before you get it. Our eyes were opened reading the newspaper that was given to us for free by the man in the kiosk. The title: Messages from your municipality. 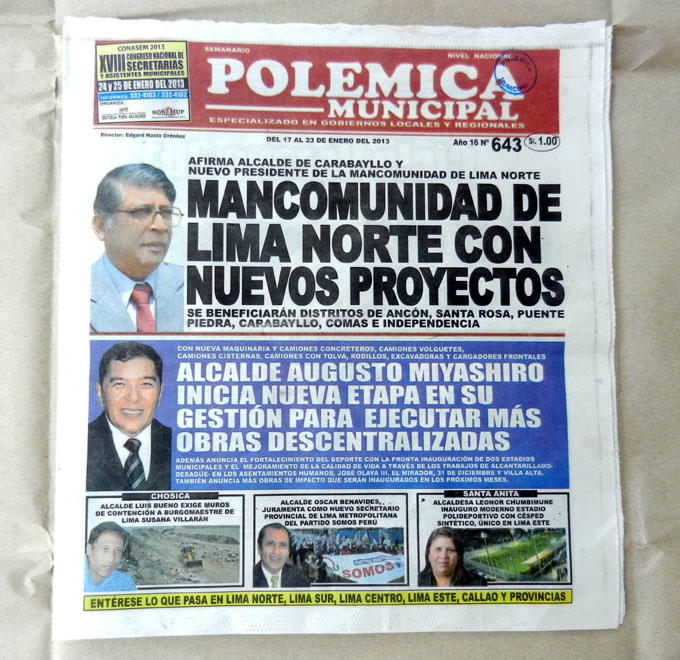 In it mayor after mayor of the different municipalities, Lima has 39, who announces "obras". Articles with Work to be done, to be completed or machines that have been purchased to do the work. Especially stairs and walls are popular and are summed up round numbers: 300 stairs, 30 wall. Stairs connect the houses build on the hills, walls ensure that the earth does not slide and houses are buried. The construction of these things is simple and effective: residents experience an instant improvement of their daily live. More complicated facilities, water, electricity, sewage, are less popular undertakings. Complex issues such as transparency and proper administrative functioning are up to now not publicized as 'work in progress'. For us construction work is bad news: open streets, diversions. Budget overruns. Many aldermen are sent home because of them. Here, the opposite applies. Here building is a sign of managerial vigor. Around election time, it is so bad that the city is blocked up for weeks: anyone who wants to be reelected breaks the open street. Why? Because, here something happens that is quite unimaginable for us: every mayor puts his name on the building sign: "This work is brought to you by: mayor this and that". This building is made under the direction of ... In parks there are plaques: thanks to this gentleman you now enjoy shadow. We get really annoyed: why thank you? You are just doing your job. Serving the public interest. We expect, no, demand, public administrators to be incorruptible . Here the mayor behaves himself as the landowner who shows how well he treats his subjects. A staircase, a wall, it's actually a favor. Some are more democratic and modest, like the current mayor Susana Villarán, She refuses to sign her own name and instead just puts: Lima has done this. On the street this doesn't communicate. They say: She does nothing, no obras, she is weak. While more stairs are built, more walls against subsidence are constructed, the express train runs after 20 years of planning. Not signing, but just serving the people, it is the first step towards the normalization of relations between authorities and citizens. The next step can be more transparency and proper auditing. Because there is an additional reason for doing many obras: nothing lends itself so well to shady accounting and favourism. But that is not on the plaque. For the first time, Lima has a gerente de Cultura ". Pedro Pablo Alayza. Previously it was a sub-gerente. It is the difference between a Minister and a Secretary. A lot is expected of culture. The hope is that by encouraging and supporting culture a start can be made with building trust and cohesion in the city. 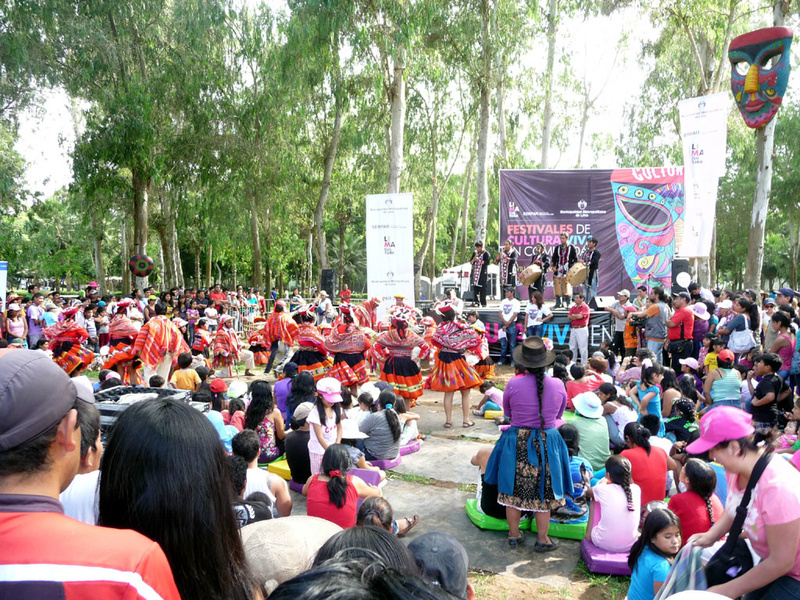 The program that runs for two years now is called 'cultura viva", live culture. It provides both physical space for groups to practice and perform but also lessons in organisation. During the cultura viva festivals, groups can present themselves. At this moment a website is being launched where you can inquire about cultural initiatives in your own district. Or how you can start an initiative yourself. What is as culture in Cultura Viva? Singing, dancing, music, art, theater and sports. Not necessarily high culture. Also folk dances and traditional music. That culture that lives or is latently there. If you speak with Pedro Pablo you're impressed with the confidence and optimism. He is already busy with the next step: an international festival of community culture.